I’m always looking for a new way to get my healthy dessert fix. I’m the girl who buys candy molds off Amazon to make low-sugar versions of my favorite sweets. When I was casually scrolling through my Instagram feed and stumbled across a stack of chocolate bars loaded with a creamy avocado center, it’s safe to say I was close to drooling on my phone. Avocados and chocolate aren’t the most common combination, but leave it to Lauren Kirchmaier, the writer behind Flora & Vino, to find a way to make them taste like they’re soulmates. 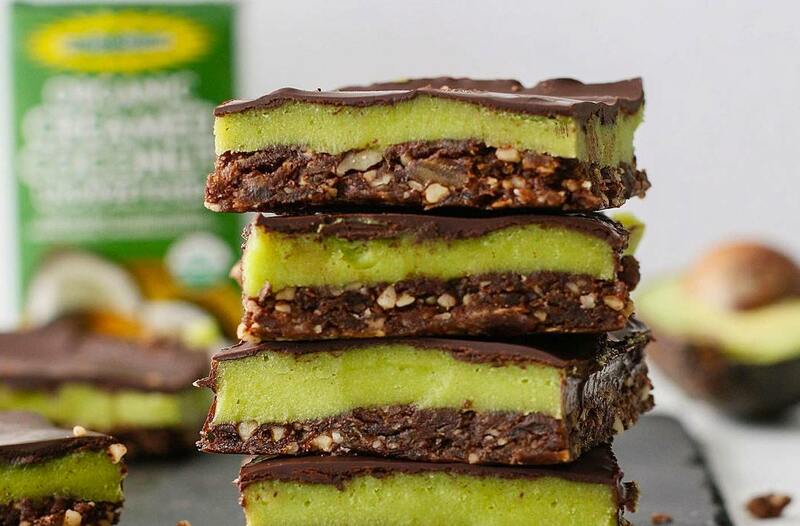 The 7-ingredient chocolate avocado coconut cream bars are free of gluten, grains, oil, and refined sugar, making them a perfect addition to just about anyone’s healthy treat line-up. Another secret ingredient for the ultimate melt-in-your-mouth goodness: creamed coconut, which is made from dehydrated, fresh coconut meat for an extra-rich texture. While these bars look like they might be complicated to make, they don’t even require baking. “We start with a chocolatey date walnut crust then move to a creamy avocado coconut layer sweetened with pure maple syrup, then top it off with melted chocolate,” Kirchmaier writes. Really, after little more than a quick blend and some freezing, the sweet green delights are ready to eat. 1. Line an 8-inch pan with parchment paper and set aside. 2. Add all base ingredients to the blender and process until you have a sticky dough. Press dough in an even layer in the lined pan and place on the freezer to chill. 2. Add all avocado layer ingredients to the food processor or blender until completely smooth. Remove pan from the freezer and smooth over the base layer. Place pan back in the freezer. 3. Melt chocolate in a pan over medium low. Remove pan from freezer and pour chocolate over the avocado layer and smooth with a spatula. Place pan back in the freezer. 4. After 10 minutes, remove pan and slice into bars before the chocolate hardens completely. Store bars in the freezer for several months. If your sweet tooth isn’t satisfied quite yet, you’re in luck: There are plenty more options for you to gobble up. Try this copycat version of Milk Bar’s cake truffles, or even these low-sugar Twix bars that taste just like the real thing.